Vini, Vedi, Vici! You have certainly heard of this before. It came from the famous Roman emperor, Caesar, and you will get to meet him on Realtime Gaming's Caesar's Empire Slot Game. You will see 5 reels and up to 20 paylines, with a wild symbol, a scatter symbol, 10 free spins and jackpots! Grand Fortune online casino offers a no deposit bonus when you sign up to play the RTG slot. Bet with Real Money- BET arrows buttons. Select the number of lines - LINES arrows buttons. Spin the Reels manually - SPIN button. Spin the Reels automatically, without any interruption - AUTOPLAY button. Caesar's Empire slot game features the gold Caesar coin, substituting for all regular symbols in the game other than the Scatter Symbol and only appears on the first four reels. The winnings will be also be tripled when it forms a winning combination. The Coliseum is the Scatter Symbol and 2 or more will bring you winnings and the winnings are multiplied by your total bet amount. A Caesar Symbol and a Coliseum Symbol on reel 5 will activate the Free Spins Feature. You can win 10 Free Spins and the wins will be doubled. The Coliseum will change to either a Caesar or a Cleopatra symbol and every Caesar that appears during the bonus round an extra 5 Free Spins will be awarded. Build your own empire when you win the jackpot of 40,000x your bet per line and you can even stand a chance to grab the progressive jackpot that can be won randomly, at the end of any spin. Created by Realtime Gaming, Caesar's Empire is available on download, instant play and mobile at the Casino. Discover Rome in all its splendour! 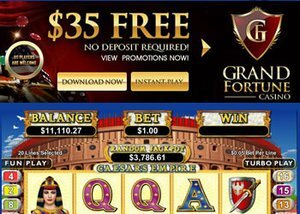 Play Caesar's Empire Slot Game at Grand Fortune Casino which offers a $35 no deposit bonus for new players.